It was Hari Raya (Ramadhan) here yesterday. All of us are at home due to public holiday. During this day we generally have lunch with our neighbor Malay family every year. Knowing that we are vegetarians she cooks vegetarian food for us separately. Since the lunch was quite heavy, I decided to make a simple yet filling soup for dinner from Cucumber, Banana Stem and Ragi. I generally add Ragi (Finger Millet) as my soup thickening agent rather than corn flour as it has better health benefits. 1. Peel the cucumber, chop into big chunks. Chop Onion into big chunks. 2. Chop the plantain stem into small pieces. 3. Take a pan add 1 tsp oil and fry onion until semi-golden. 4. Switch off the gas and add the cucumber. You need not fry the cucumber, the left over heat is fine. Let it cool. 5. Blend cucumber & onion adding water. 6. Take a soup pot add 1 tsp oil ,garlic and fry. 7. Add Plantain stem and cook for 2 mins. 9. Add cucumber – onion mix. 10. Add salt, rasam powder and turmeric. 11. Mix well and let this start to boil. 12. Now Add milk and Ragi. 13. Mix the ragi without forming lumps. Ragi is the thickening agent. 14. Let this cook for another 10 minutes. Garnish with coriander leaves. 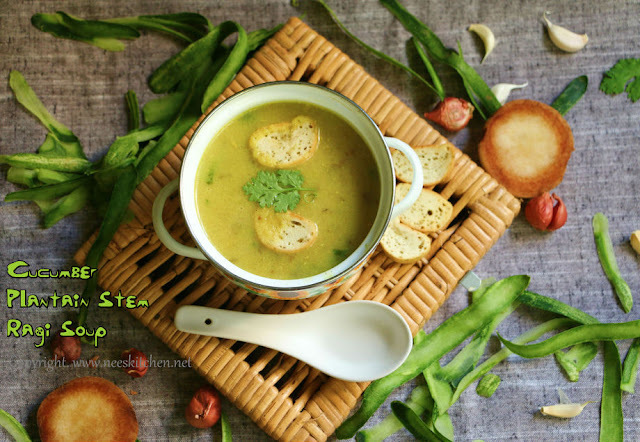 Cucumber Banana Stem & Ragi soup is ready. Serve it with some bread sticks or croutons. Ragi can be replaced with corn flour.